The airbag is an essential vehicle safety device consisting of a fabric cushion that is designed to inflate rapidly during an automobile collision. The purpose of the airbag is to provide a cushion for the occupants during a collision, and to protect their bodies from striking the interior objects of the automobile such as the steering wheel, or the dashboard. Today’s modern vehicles often contain multiple airbag systems including both frontal and side airbags at multiple impact zones. According to the Insurance Institute for Highway Safety (IIHS), side-impact crashes accounted for 27 percent of passenger vehicle occupant fatalities in the United States in 2009. The IIHS says that side-impact crashes can be particularly deadly because the sides of vehicles have very little space to absorb energy and to shield vehicle occupants. Unlike a front-impact collision where there is an engine and several feet of metal to absorb the energy of a collision, side-impact cases have virtually a couple of inches of protection in comparison. The IIHS began correlating data about side-impact crashes in 2003. The IIHS found that those vehicles that have good side ratings provide occupants with a far greater extent of protection than those vehicles that perform poorly on their test. The IIHS found that as of January 19, 2011, 78 percent of the current vehicle designs that were tested had good side ratings, compared to only about a third of vehicles that were tested in the first two years of the program. According to the IIHS, previous research had demonstrated the vast importance of side airbags; however, no vehicle without protecting side airbags had every earned a good rating from the IIHS. The chest or torso SABs are mounted in the side of the vehicle’s seat or inside the door areas and are designed to provide protection for the chest in the event of a serious side-impact collision. The head SABs are frequently mounted above the side windows and are designed to protect the head in a side-impact collision. There are two types of head SABs, the curtain and tubular. Curtain SUBs are designed to protect the front and rear occupants in the event of a side-impact collision, while some of them provide protection from ejection after a vehicle has been struck on its side. The head and chest “combo” SAB is typically mounted in the side of the seat and are generally larger than chest SABs. Combo SAVs protect both the head and chest, thus drastically reducing the risk of brain injuries. Side-impact airbags inflate in less than a second and they are designed to protect your head and chest from being struck by objects outside and inside of the vehicle in serious side-impact collisions. These SABs are controlled by sensors and unlike frontal airbags, a number of curtain SABs remain inflated for several seconds during the collision in order to provide additional protection in the event a rollover occurs. Today, some vehicles on the market are equipped with both front and side airbags. Although frontal airbags have been standard in all passenger vehicles since 1998, and all vans, pickups, and SUV’s since 1999, side-impact airbags are now being offered as optional or standard equipment on a number of newer vehicles. The National Highway Traffic Safety Administration (NHTSA) estimates that if all of the vehicles in the United States were equipped with side-impact airbags offering head protection, then 700 to 1,000 lives would be saved each year in side-impact crashes. 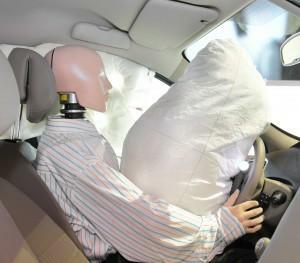 Unfortunately, unlike frontal airbags, side-impact airbags are not required by the NHTSA yet. However, with side-impact crashes taking approximately 10,000 lives each year, manufacturers are becoming increasingly aware of the necessity for SABs and legislation is expected to eventually standardize side-impact airbags in all vehicles, as they are with front airbags. Due to the vast numbers of people that die in side-impact collisions each and every year, the manufacturers are aware of the importance of this safety feature, yet a number of vehicles are still produced without this life-saving feature. As a result of this failure, a large number of traumatic brain injuries continue to occur in foreseeable side-impact crashes, many of which are from young children who routinely sit in the rear of the vehicle. According to the IIHS, safety equipment has become increasingly standard in 92 percent of 2011 models and 94 percent of SUV’s, and 56 percent of pickup trucks now come equipped with standard head and torso side airbags. When one considers the fact that lifesaving side-impact airbags have been available on the market since the early 2000’s, and yet they are only slowly being incorporated into motor vehicles, then it makes one wonder why auto manufacturers have failed to incorporate SABs when they can save lives, especially the lives of children riding in the rear of the vehicle. The fact that this key safety measure has been avoided due to cost cutting measures is simply unacceptable, and many fatal head injuries have occurred and continue to occur in foreseeable side-impact collisions to this day which is absolutely unreasonable. If you or someone you love has been injured in a side-impact collision, then we urge you to contact a Alpharetta personal injury lawyer immediately for assistance.